On this first day of winter (can you believe it?) 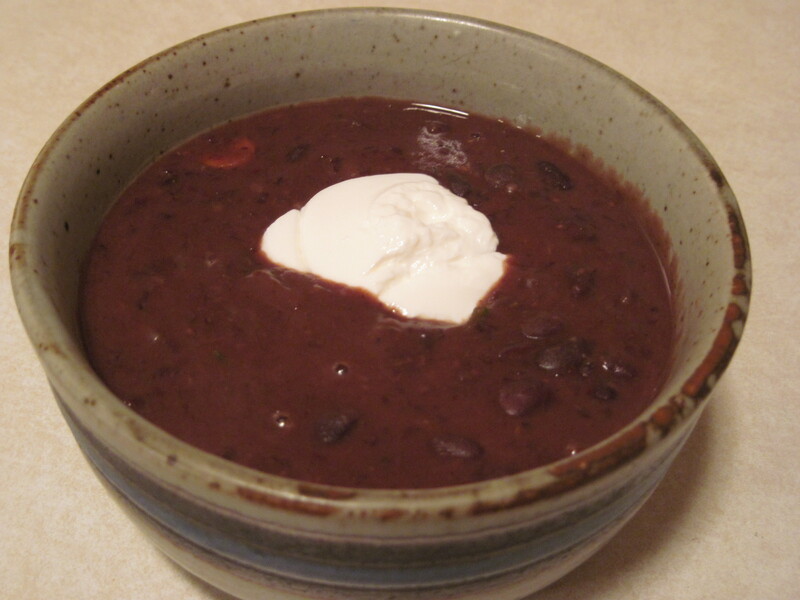 I’ve decided to post the recipe for my favorite black bean soup. This is a perfect vegan winter dish, and it’s so hearty that even my dad and brother love it. If you can eat sour cream or plain Greek yogurt, they are great toppings for this soup. Also, if you can eat bread, it’s nice to serve this with a nice crusty and/or chewy bread, like a baguette. The original recipe came from the book “Okay, So Now You’re a Vegetarian,” which I bought when I was in ninth grade, and my mom and I have tinkered with it a bit. This soup is really easy to make because you throw most of the ingredients in a food processor first, and then throw everything in a pot. So you don’t have to worry about the dangers of blending hot soup. In a food processor or blender, combine the heated jerk seasoning, 2 cans of black beans, the vegetable broth and the olive oil. Puree until the mixture is almost smooth. In the original pot, combine the puree and the remaining 2 cans of beans, chopped carrots, cilantro and green onions. Bring to a boil, then reduce to a simmer. Simmer for about 10 minutes, stirring occasionally. Stir in the lime juice. Serve with sour cream/Greek yogurt and/or bread, if desired. To reiterate: Do NOT breathe in the heat that comes off the seasoning as it browns. I think this heating step improves the spice’s potency, but if you breathe in that heat, you won’t be able to stop coughing. And if you let the spice burn, you might as well go out to dinner and leave the windows open to get the smell out of the kitchen. 😉 So if I’ve scared you enough that you want to skip this step, I don’t think the soup will suffer, but you might want to let the soup simmer a little longer. Also, McCormick’s Perfect Pinch Caribbean Jerk is the best jerk seasoning we’ve found, but jerk seasoning seems to be kind of hard to find in general. And the other day I found these Dorot frozen chopped cilantro cubes at Trader Joe’s. They are awesome because I love cilantro — but I hate chopping it. And I never have the patience to chop it as fine as I would like it, so I’d usually end up with large leaves in my soup. But I just needed four of these concentrated tiny cubes to flavor the soup, and they dissolved completely, as far as I could tell. If you can’t find Dorot’s, I’d try processing and freezing cilantro so you can have it on hand, anyway, because the fresh stuff doesn’t last long. You can substitute chicken broth for the vegetable broth if you prefer. And you can use lemon juice instead of lime juice, but I like the lime flavor better. If you don’t want to add the carrots, you don’t have to — they just add a little extra bulk and heartiness. I’ve found that the time it takes to bring the soup to a boil (on my gas stove), plus the 10 minutes of simmering, cooks the bite-sized carrots perfectly: no longer crunchy but not quite soft. This recipe makes a good amount of soup, so it’s perfect to save for leftovers. The flavors continue to improve as they continue to meld. Also, the soup will thicken up a good deal as it simmers and even after it stops cooking, so if it thickens up too much for your liking (I like a really thick black bean soup! ), you can always add a little more hot water when you serve it — and then it goes even further!